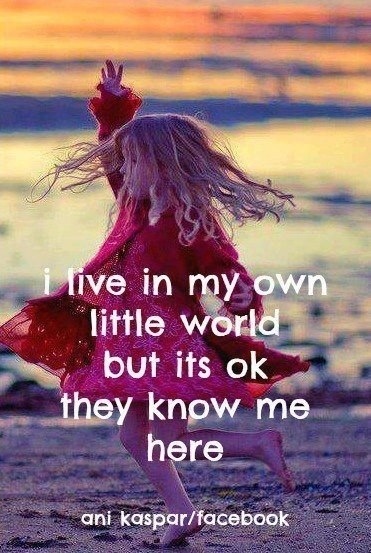 I’m just going to sit back and enjoy my “own little world” for a few days…. I might not be back the rest of this week, but I’ll try and be back on Monday of next week. This entry was posted in life and tagged celebrate, comfort, enjoy, journey, life, my world, Peace, rest, security, where I live. 🙂 And it made me smile just knowing that somebody else can relate to what I meant by it! I’m working on the healing and the rest, it doesn’t hurt nearly as bad as it did at first, so it’s much easier to concentrate now. Well, as easy as it ever is for ME to concentrate!!! 🙂 My brain has a tendency to get stuck in neutral sometimes! My own little world is a wonderful place to be. Enjoy! Oh you know it is! She sure is! Certainly looks as though she is lost in her own little world, that’s for sure! Yep – I sure did. Sometimes it’s nice just to “turn your brain off” and relax and enjoy the moments as they come!